The TXC1 controls turntables from DCC or manual commands. It drives the turntable to a specific track exit, counting the exits automatically: this allows hands-off control. DCC control allows the turntable position to be set from a normal DCC throttle, or by a DTM30 type panel. Computer control systems such as "Traincontroller" can operate the turntable, and display the correct position through a LocoNet interface. The TXC1 works with Atlas, Hornby and Fleischmann turntables. It can also control the Marklin Z gauge linear traverser. Hornby and Atlas type turntables need a simple magnet and sensor (supplied) to be mounted to the "Geneva disc" mechanism to sense when it is located at a track exit. Unfortunately, the TXC1 does not work with the PECO turntable. If the board is used "as is", it displays the track position number on a display. Pushbuttons for "move clockwise" "move anticlockwise" and "turn 180°" are provided. A user constructed display panel is possible. The TXC1 will drive external LEDs to light up the current track position. 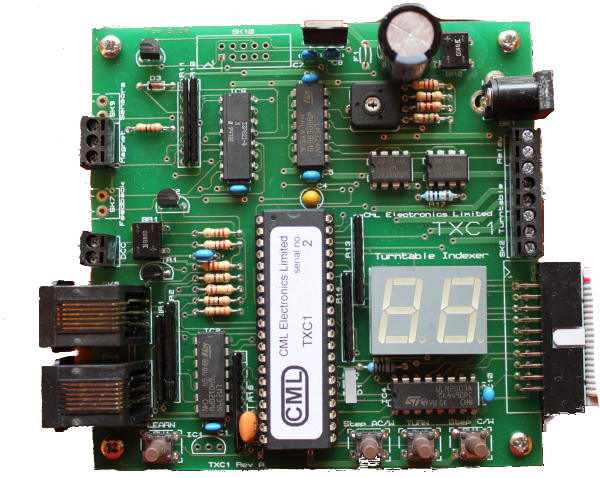 Extra pushbuttons can be used to allow the TXC1 itself to be mounted away from the display panel. There is also an optional display board providing a rotary control knob and a convenient way to mount the LEDs. The knob provides intuitive control for "turn clockwise" and "turn anticlockwise"; if the knob is pressed in, the turntable rotates 180°.